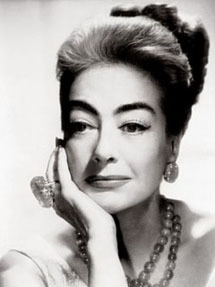 Joan Crawford was a Star. As much a Hollywood creation as anyone before or since. But she was also a hard worker, an ambitious actress who worked for over forty-five years in her chosen profession. Born Lucille Fay LeSueur in San Antonio, Texas in 1904, Crawford had a troubled childhood and initially wanted to be a dancer. She won a trip to Hollywood in 1925 and soon appeared in small roles in silent films of the period. A magazine contest gave her a more glamorous new name. Crawford's first picture was Pretty Ladies but she didn't hit the big time until her role as a "jazz baby" in 1928's Our Dancing Daughters. It was a part well suited to her personality - and she worked non-stop from then on. In fact, she was one of a handful of actresses who made the leap successfully from silent films to talkies. Throughout the '30s, she starred in as many as three to four movies a year, often playing a shop girl or a woman from the wrong side of the tracks who makes good. Among her co-stars, Clark Gable was a favorite...both for the fans and for her personally. By the end of the decade, Crawford's star was waning and she was labeled "box-office poison." She made the first of several comebacks with a part in The Women, as a scheming mistress...and she would finally win an Oscar for the title role in the classic Mildred Pierce (1945). After reaching this career high, Crawford showed more of a dark side by continuing to appear in film noir. She won a second nomination for 1947's Possessed, a Fatal Attraction-type story in which she played a spurned psychotic who guns down her lover. Yet a third nomination would come for Sudden Fear (1952), a superb thriller in the Hitchcock vein. Crawford pulled out all the stops and was excellent as a wife who finds out her husband is plotting to kill her...and who then uses her skills as a writer to save her life. There was another decline in the late '50s, as Crawford concentrated on her marriage to Pepsi president Alfred Steele. After his death, she looked to jumpstart her career and in 1962, What Ever Happened To Baby Jane? came her way. As Blanche Hudson, a paraplegic tormented by her sister (Bette Davis), Crawford had the less showy role. But it was a smash that put her back on the map. 1964's Strait-Jacket, directed by William Castle, was a lurid ax murder affair but Crawford was game. Playing a woman convicted of killing her husband and his mistress...and who is then suspected of further murders upon her release from a sanitarium, she was sympathetic and sincere. Not the kind of movie that wins awards, Strait-Jacket was nevertheless a hit with audiences. Now in her sixties, she was featured in Castle's I Saw What You Did - and as tastes changed, she continued to star in horror vehicles, ending her feature film career with 1968's circus slasher, Berserk! and Trog (1970). In between, she also starred in a classic segment of the Night Gallery TV pilot, which also happened to be Steven Spielberg's first assignment. Crawford's final acting appearance was in the TV series The Sixth Sense, in an episode entitled Dear Joan, We're Going To Scare You To Death. She died in her New York City apartment in 1977 of cancer.